Is your retractable screen Winter ready? No matter what state you live in, the winter months impact everything inside and outside your home, including your retractable screen. With the winter months coming up, now is the time to prepare your retractable screen for the cold. Take a look around your screen and make sure it is free of debris, dust, and insects. Use a mixture of warm water and a mild dish detergent with a soft brush to clean around the screen and the screen itself. Never use a spray like WD-40. These sprays attract more debris and interfere with the screen's normal movement. If you must use a spray, use a silicone based lubricant. Use extra care when rolling them up and down in the winter to avoid debris and moisture build-up. Also, never lower the screen when there are wind speeds more than 15 mph. Similar to clear vinyl, mesh screens are susceptible to contracting in the cold, but not to the extent of clear vinyl screens. 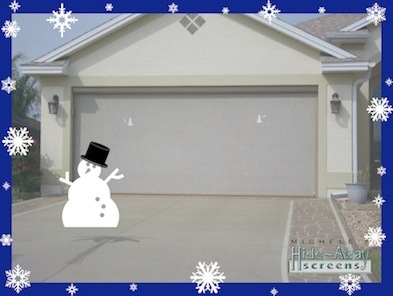 Leave these screens down whenever possible to avoid the build-up of moisture and mildew. Never use a power sprayer to clean and make sure the screens are thoroughly dry before rolling them back up. Get the maximum life out of your motorized retractable screens, contact Michele's Hide-Away Screens today for a FREE quote.